Say, shouldn't this books series have its own thread? There's at least a dozen posts about it in here. Indeed it should. Fearless Leader has heard the call. I really don't like the Cheysuli, they're so arrogant - Being "children of the gods" and all... They are all, almost to a man and woman, supremely annoying. The only Mujhar (king of Homana) who's likeable is Carillon, the one who is not a Cheysuli by birth. Sure they have special powers - but so do the dragonriders of Pern and the Heralds and the Hawkbrothers of Valdemar, and these are not at all arrogant - except maybe Elspeth because she's the Crown Princess, but she comes back off her high horse quickly enough. 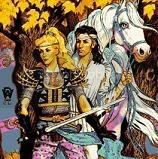 I agree about the bond between Cheysuli warrior and lir animal is not as well-depicted as the one between dragonrider and dragon in the Pern series, or between Herald and Companion, and between Hawkbrother and bondbird, in the Valdemar series. Ms. Roberson doesn't make us care for them, the way we care for the dragons and the Companions. There are also big plot holes. Like when Blais' lir is killed inside of Homana-Mujhar, which is supposed to be protected against Ilhini sorcery. You never find out who killed her, or how, and strangely enough evreyone from the Mujhar down accepts the murder without so much as an investigation. It's a good read, but not one I come back to, like I reread the Valdemar and Pern books regularly. Not to mention The Lord of the Rings, but that's another dimension of fantasy altogether. Didn't you mention that you also reread The Dresden Files once or twice? In English and French? Quite. I did reread the whole Dresden Files series, all 15 books, cover-to-cover, twice in English (that is, I read the whole series 3 times), but read it only once in French - but then I only bought the French books last summer. I did reread the first 4 Harry Potter books a couple of times, the later ones just once. Harry started getting on my nerves big time.